The Irrigation Department is responisble for conducting research in irrigation and management of land resources. The major objective is to optimise water use for plant growth. The development of software for irrigation scheduling. The Irrigation Department has long been associated with research in drip irrigation of sugar cane in collaboration with the Institute of Hydrology (UK). The physical processes controlling the response of the crop to different combinations of irrigation regimes, dripline placement, irrigation rates and cane row spacing have been studied. Problems associated with the system have been well mastered and its advantages highlighted. The system is now being studied under fully mechanised conditions and in the new cropping system. Drip irrigation is considered as the most efficient of all systems and hence its choice in various irrigation projects both in the private and public sectors. The centre pivot irrigation system, capable of irrigating large areas, is gaining importance and is replacing the existing overhead system. To help centre pivot users to operate and to maintain the system the Department has produced an operation and maintenance manual and has developed an irrigation scheduling software (IRRIPIVO). There are numerous constraints to optimal cane productivity, in terms of water, labour and irrigation systems. An Irrigation Management Information System (IMIS) is required as a tool for planning day to day management, and for data analysis and irrigation scheduling of multiple irrigation systems. 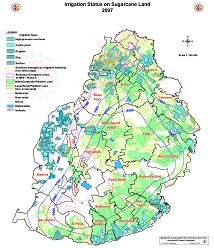 This information system will be used in conjunction with a Geographical Information System to spatially capture, store, manipulate and manage irrigation-related datasets such as climate, soil and water budgeting. Ultimately, IMIS will allow the irrigation manager to allocate the available resources (water, labour, etc.) for optimal cane productivity. Wastewater from various sources can be a major problem to the environment and has to be disposed of without being a health or environmental hazard. With the gradual reduction in water for agricultural purposes, this type of non-conventional water can be of interest for irrigation, so long as it does not harm the environment or the irrigation equipment. Long-term effects of using factory wastewater for irrigation are being studied. If there are no detrimental effects on crop, soil or lifetime of irrigation equipment, this wastewater will lead to yield increases while being disposed of in an environmental-friendly manner. The long-term study of soil quality, as affected by cane cultivation and the application of mechanization to various cultural practices. With the increased public awareness of environmental issues, soil erosion under cane cultivation has to be studied in relation to the long-term sustainability of the industry. Rainfall, soil physical properties and cultural practices directly affect runoff and soil erosion. In addition to field studies, computer modelling is being used to quantify the impact of various practices under different climatic conditions. Monitoring the evolution of irrigation, derocking and mechanization. 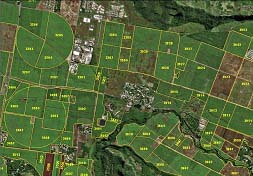 Assessing and mapping of land use and other characteristics of the land. Assessing spatial variability for sugarcane land management for increased productivity by using multispectral radiometer, soil sensors and satellite imageries. Assessing the impact of spatial field variability on sugar cane production and the feasibility of establishing site specific management zones for managing spatial variability. Rehabilitation of small-planters’ cane land. Field layout extraction using SPOT panchromatic image and air photos. The Department has fully-qualified staff and a well-equipped laboratory as well as field equipment to deal with the various aspects of irrigation management, surface drainage and soil physical studies. Services are provided to local as well as overseas sugar cane producers.